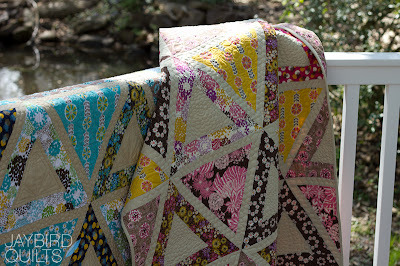 I shouldn't pick favorites... but not only do I LOVE these quilts I also LOVE how the photography went for them. We had days & days of rain and gloomy weather so I was excited as can be when the sun came out!! So here she is... Chopsticks! Quilt measures - 49" x 60"
Here is the back of the pattern. It has four size options and will include full size templates that can be used in place of a 60° ruler. The ruler that I used is the new large 12" 60° ruler from Creative Grids. 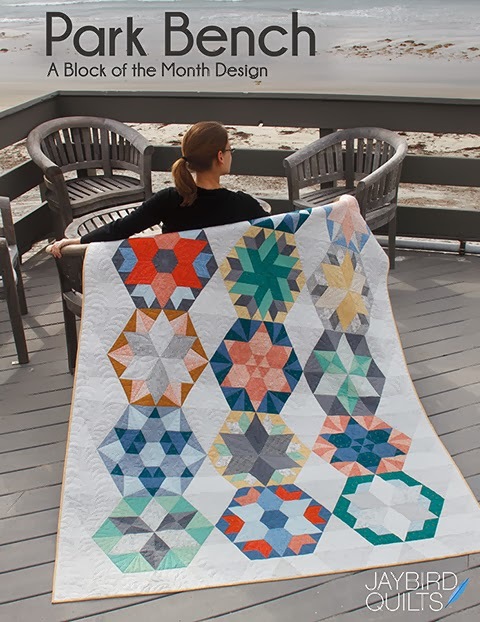 Most of you know that I love working with 60° angles from the Hexagon Quilt-A-Long last year. This super sized ruler adds so many new possibilities! Some cover photo shoot outtakes. I wanted to shoot by the water... but I was afraid I'd drop the quilts in... so this was as close as I got. Not a bad photo, but in the end I decided to make the blue quilt the focus. The lighting from this side wasn't doing much for the quilts. 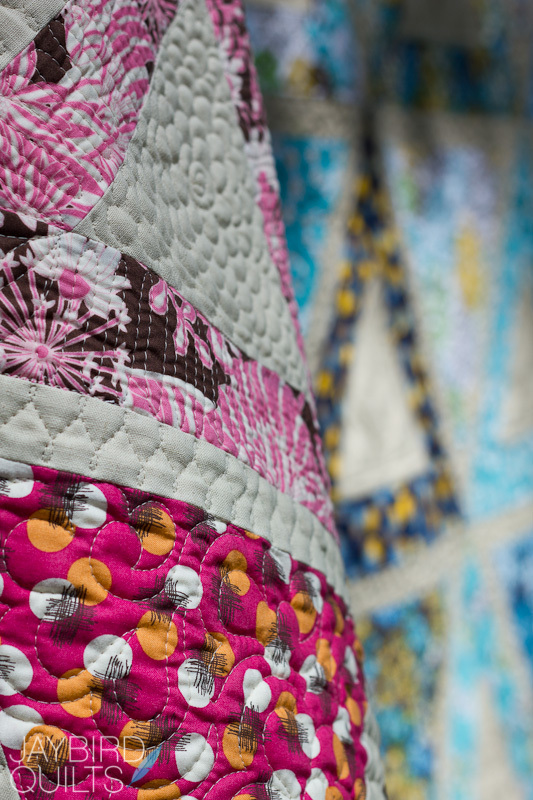 I love how this shot shows the detail in Angela's quilting. I'm sure by now everyone knows how much I love Angela's work... but honestly each time a new quilt comes home from her I'm amazed by what she does. 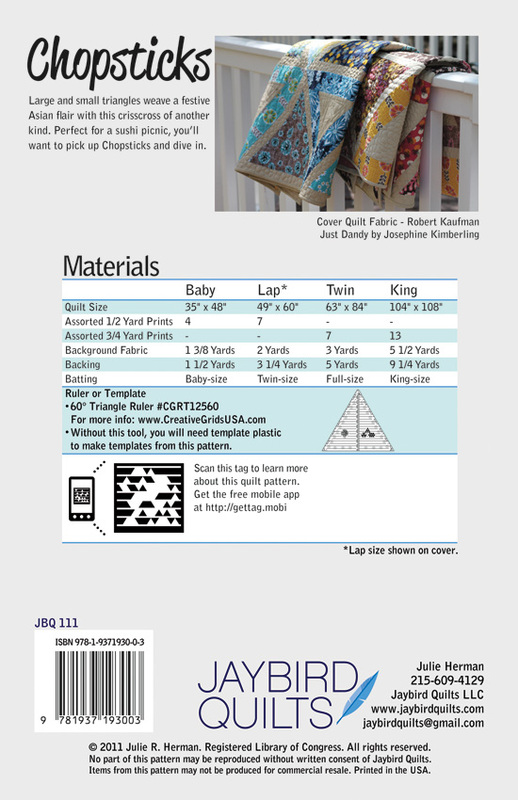 I always ask Angela for a few words about the quilting on each quilt so that I can include it in the pattern. This way if you want something similar done you could communicate it to your quilter. I quilted triangle shapes in the center of the triangle and quilted small pebbles in the lighter outer borders. In the center of the triangles, I quilted a flower, filling up the whole space. I also used a wishbone design in the thinner outer borders of the triangles. More odd lighting... but it does show you the quilting! This photo didn't show enough of the pattern... and has it on it's side. I thought maybe folding one of the two would be the way to show both... but none of those photos did it for me. While this wasn't "cover" material it does show you more of the quilt that most of the photos do. At the end I shot a bunch with them both folded & ended up with a few of my favorite photos from the day. Soon I'll show you my #1 favorite photo. I hope you love her as much as I do!! If you are coming to Quilt Market be sure to stop by my booth, #2644, to see Chopsticks in person! noteThis pattern will be available after Quilt Market. When I have an exact date from the printer I will let you all know! you have my address - pick the one you least want and send it my way. ps - congrats my friend on another awesome pattern. I super puffy heart this pattern! and of course Angela just made it even more spectacular. Booth #2644 is going to rock! WOW ! 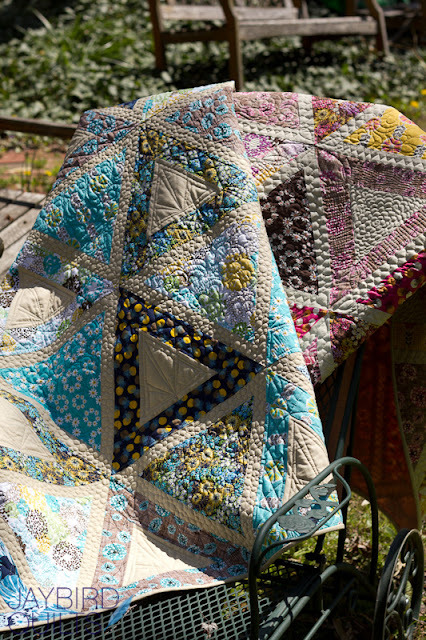 these quilts are absolutely GORGEOUS ! Now I am thinking THIS ONE is my favorite of yours , well so far anyway ! I'll send you my address in case you want to send ME one, not Rachel ! And Rachel can send me one of HER quilts too !! Gorgeous! Such a shame that I'm so bad at triangles. Sigh. you have got to be one of quilting's rising stars! so original! I love it. Can't wait to make one of these. Great job Julie! So proud of all of your accomplishments! This design is beautiful! I love how they turned out! This is one of your best yet! I LOVE it! Wishing you tons of success at market! This pattern is beautiful!!!! I love it! You keep feeding my ruler fetish too! I love this quilt. Another one on the list to do. Wish I could be at market to see your booth debut! You know what I love best about your patterns? I love that they make the fabric more beautiful...your patterns are interesting without being over done so I can still enjoy the fabric....then the quilting....a beautiful combination you have found. A great combination! Fun, Fun. Thanks for the Market booth # - I'm sure to find you now!! LOVE, LOVE, LOVE. I can't wait to get the pattern. They look fantastic. Another one...oh, goodness. I don't know how I'm ever going to keep up! I want each and every one of your patterns. I really love this pattern. I will buy it when it is available. Congratulations on having your own booth at quilt market. I love love love this! Like, really! I'm a huge fan of your designs but haven't felt solid enough in my quilting skills to venture into something so fancy quite yet. THIS pattern, is gonna get me out of my scaredy-cat cave for sure!!! LOVE THIS! What a great pattern! Keep them coming! 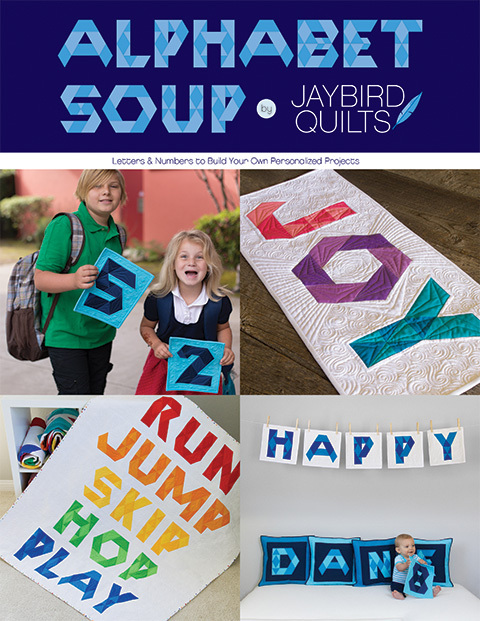 They're always inspiring and helps a beginner quilter like me find new things to try. Also, do you have fabric requirements for full-sized? OK... I WANT this pattern!! I have some fabric sitting in my stash that I have been holding waiting for the perfect pattern, and I think this is it! Fabulous Julie! 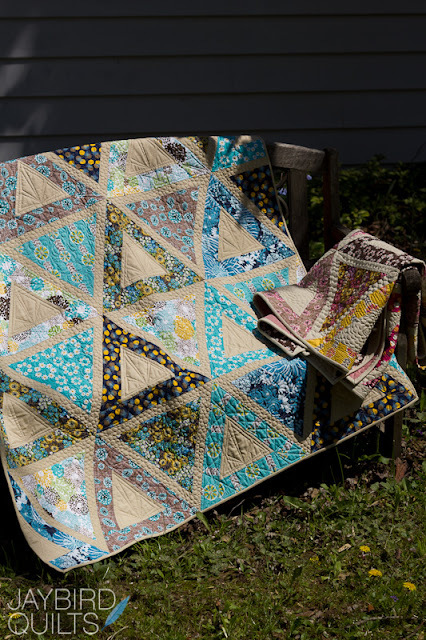 I wish I could come to market so I could run my hands over these quilts! I bet the feel wonderful with all that quilting! Love the color combinations too! 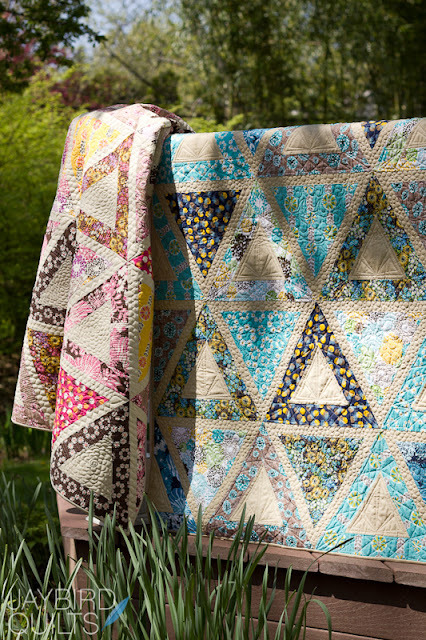 Love everything about this quilt..the colors, the quilting, and the design...how perfect! 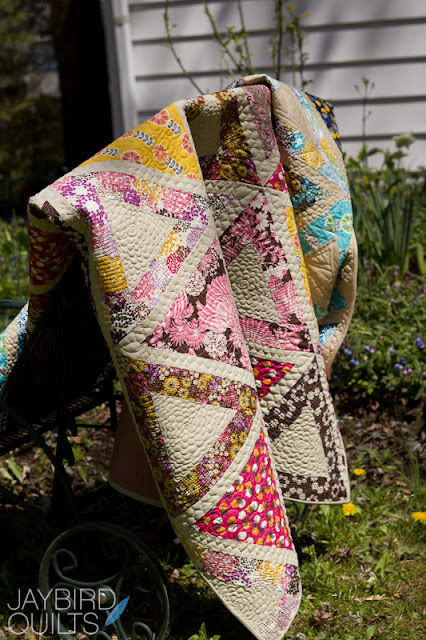 I love these quilts, I want to run and make one!! Really love this design and of course, they look beautiful in these fabrics. Wondering how you came up with the name. I saw the name before I saw the photos & I don't know what I was picturing-but it was something far different. oh, these are WONDERFUL Julie! And Angela's quilting is brilliant as usual!!! Takes my breath away! So beautiful! Thanks for sharing the outtakes, too. Congratulations on another great pattern! 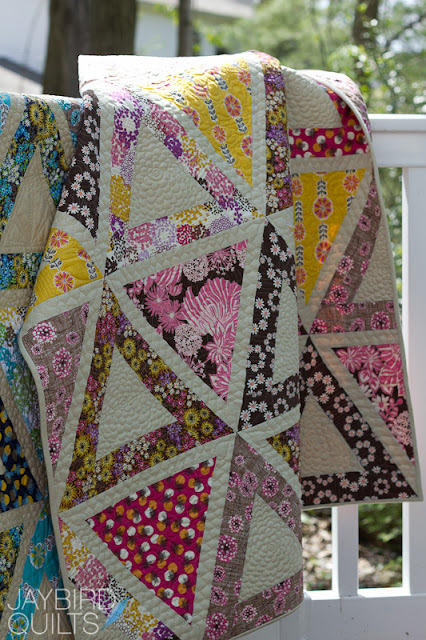 I love the wishbone and flower quilting on the pink version too. Love! See you at market! I love this! It's going to be great for showcasing larger prints! Also, I wanted to let you know how much I appreciate seeing all the outtake photos. It's so nice to see your process and know that it can take quite a bit of shooting to get the image that you're happy with. I'm sure as you continue there will be fewer and fewer outtake images as you get a feel for what works! Outstanding pattern and quilting designs. 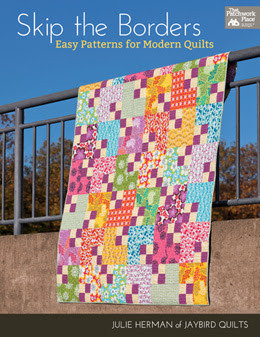 I am in love with the Quilters Linen. It's my new solid! I have looked into those barcodes and would be interested to know how you go with them. Great pattern Julie. Wishing the best for Market. Those are so awesome. Just love them and I am sure they will be a big hit at Quilt Market. Best of luck and have a lot of fun. Anyway, great quilt. LOVE IT! Wow! I love this pattern! I can't wait to get it into my hands! Love, love, love Chopsticks. I can't wait to get my hands on that pattern! What a great pattern, Julie! Your designs are so fun and unique! You go girl! I love this pattern Julie. Just want to get on a plane and come to quilt market!! I think I will have to get this pattern! Another stunning quilt pattern. I love how the quilting adds so much more to the quilt. So creative! Love it, and you've made me appreciate triangles in a whole new way. Girl, you must have had a creative explosion go off in your brain! Absolutely gorgeous!!! Keep up the great work! Wow! Love love love this. Impressive! Great pattern! Great quilt! I LOVE this! 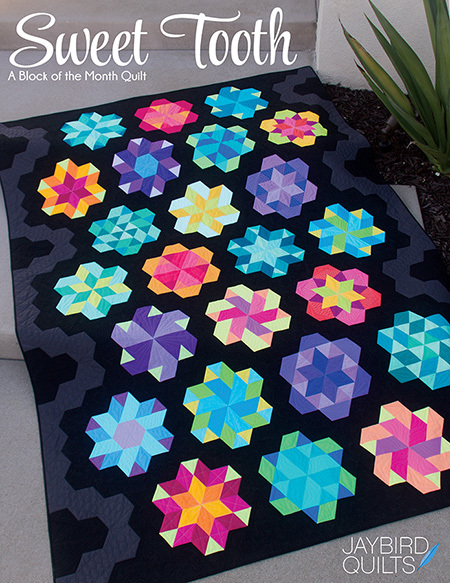 Can't wait until it's ready for purchase, this is definitely going on my (very long) List of Quilts To Make! I love this pattern. This is my favorite pattern of yours so far. LOVE it!!!!!! That is a really neat pattern. I love clean lines and this pattern is perfect for my first foray into triangles. Thank you for creative patterns. I loved Fast Forward as well. Gorgeous! Love the two colourways! 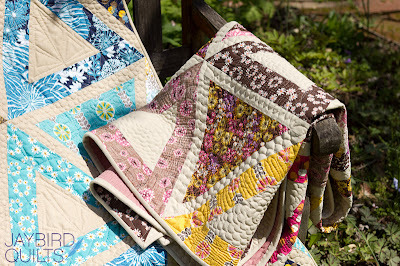 How could you possibly pick a favorite from those fantastic quilts? Love them all.........nice job on the design, fabric choices and the quilting.....a real winner. Each pattern design is better and better. We look forward to seeing your booth in Salt Lake City. These quilts are stunning!! Nice job. Love it!! I love your blog! I was having trouble deciding which of your patterns I like the best, but this one takes the cake! Congratulations! I'll be waiting for a copy of this! Thanks. Love this pattern! So simple yet so striking. Amazing. Oh I love the pink/purple one...very pretty. 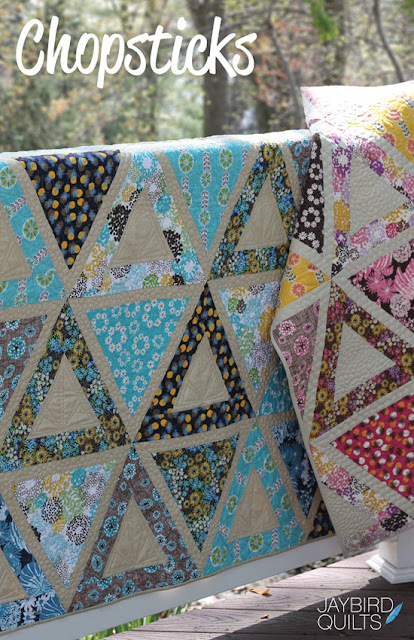 Angela's quilting looks amazing! Can't wait until the pattern comes out! I am so happy I found your blog. I love this quilt. I can't wait until the pattern comes out to give it a try!!! 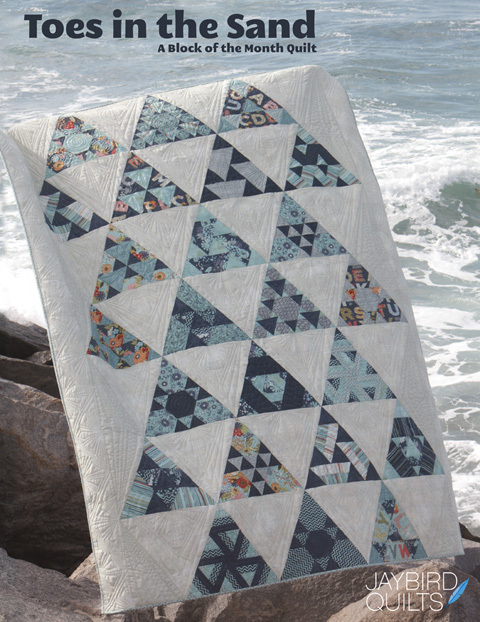 i love blues and i love everything about this quilt! These are so beautiful! Can't wait to hear about your time at quilt market! Beautiful fabric and this is a FAB pattern. I can't wait till it's available because I'll snap it up! I have the ruler now I want/need the Chopsticks pattern. Please e-mail me when I can buy one! 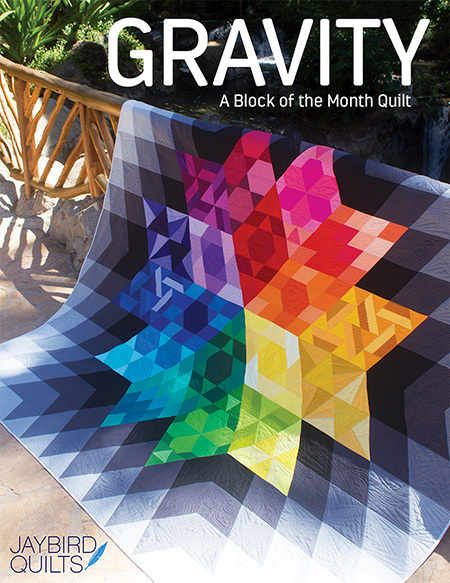 Okay, I know I'm late to the gorgeousness that is this quilt, but I just want to say this quilt is amazing to me, design, fabric, all of it. Giveaway! - Off the Rail Pattern & Fabric! Plaid Parade & Off the Rail are here!! 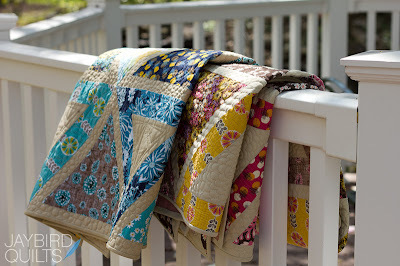 Sponsored Giveaway: Featuring Fabric Shoppe!